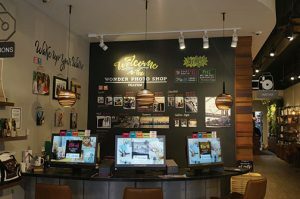 Christine Appelbergh and Jen DiCesare at the Fujifilm Wonder Photo Shop in New York City. 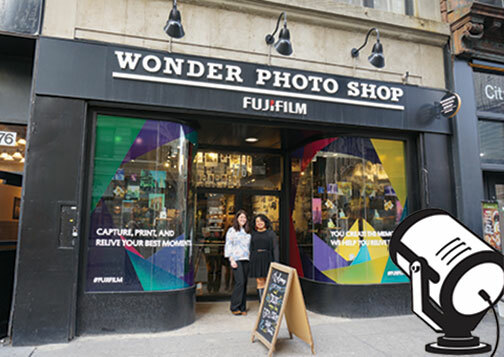 Located across from the iconic Flatiron Building at the oddly angled intersection of Broadway and Fifth Avenue at 23rd Street in Lower Manhattan’s old photo district is the Fujifilm Wonder Photo Shop. The store at 176 5th Avenue is a bright, enticing, 2,000-square-foot retail space that showcases Fujifilm’s products and services. Its transcendent mission goes beyond conventional marketing and branding. It embodies a holistic vision of photography, from picture taking to printing, sharing and social networking, as a creative life experience. Or, as Fujifilm’s release astutely puts it, the Wonder Photo Shop is “meant to act as a catalyst for a Photo Renaissance, a rebirth of the enjoyment of photography.” After shooting pictures of the charming exterior, I entered and was greeted by Christine Appelbergh, Fujifilm’s manager of Marketing Communications, and Jen DiCesare, the store’s ebullient manager. I felt as I was walking into a new and different world—a photographic dreamland where anything is possible. It occurred to me the feeling I was having was similar to what I’d experienced walking into the Apple Store. The products and services are quite different. However, the intoxicating ambience of precision, perfection and competence, as well as the expectation of satisfaction and of being in the right place, was very much the same. The sheer graphic design of the place is stunning, and it presents a plethora of options for visitors, all extremely well organized. “This is certainly an impressive retail space in a great location, but how do you see your mission?” I asked. “We think of ourselves as a destination location,” Jen DiCesare replied. “Our goal is to provide a range of experiences to our guests that elevate the role of photography in their lives. We want to enhance their creativity and allow them to achieve greater satisfaction. “Of course we want to promote the Fujifilm brand, its products and printing services, Instax instant picture cameras and film, and X Series cameras and lenses. However, education in the form of hands-on workshops and lectures, verbal interaction, image sharing and social networking are essential parts of what we’re about. 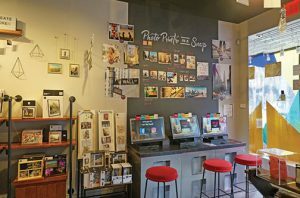 In short, our overarching goal is to reinvent the culture of photography with and for the modern consumer, and to ensure we play a significant part in that ongoing process.” The first Wonder Photo Shop opened in Tokyo in early 2014. In addition to the New York and Tokyo locations, there are six others. There are shops in Bogota, Shanghai, Barcelona, Auckland, Kuala Lumpur and Dusseldorf. Another is set to open in Dublin, Ireland. Each differs somewhat depending on the needs and tastes of the local consumer. But all have a welcoming ambience to make people feel comfortable spending time in the store. For example, the New York store offers free coffee and inviting places to sit while you’re waiting for prints. 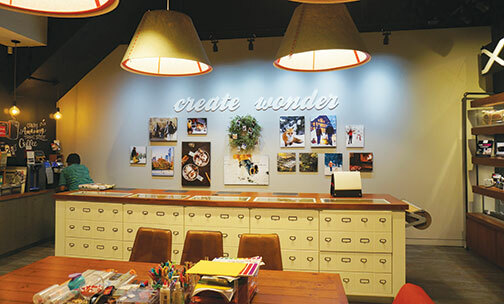 In addition, there are free scrapbooking materials available. 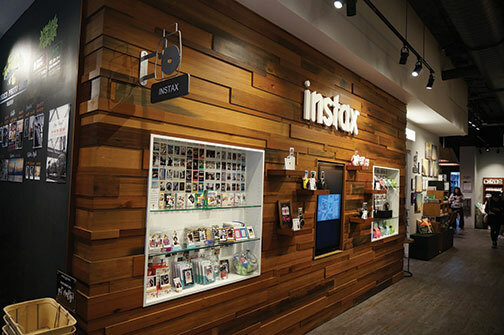 It also permits visitors to make Instax instant prints, even from a cellphone. In addition to being bright and colorful, the New York shop is a masterpiece of interior design. It’s brilliantly organized to enable customers to have an engaging “voyage of discovery” while easily finding what they’re looking for. There are large displays of Fujifilm Instax instant picture cameras, including the SQ10 square-format model. And there is a range of Instax films and the SP-2 and SP-3 Share printers. At the back of the store is a comprehensive display of Fujifilm’s upmarket X Series mirrorless cameras. And all are available for a hands-on demo, a free same-day loaner or purchase. Moreover, a well-stocked film station includes Fujifilm 35mm and 120mm films in color negative and color positive, or “slide” film. 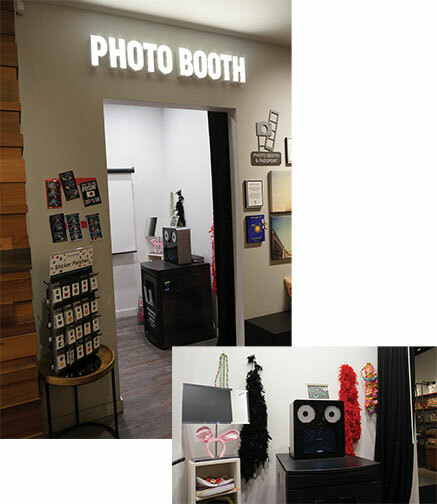 In addition, there’s a photo booth with background environments, props and custom templates for shooting selfies or passport photos. A large printout area has three workstations. There is also a crafting table surrounded by comfy chairs where crafting lessons and workshops are held. Even the beautifully rustic wood-clad main counter at the back of the store, offset with hanging green plants and lanterns, provides an uplifting experience. After experiencing this interactive space, customers are encouraged to provide feedback. 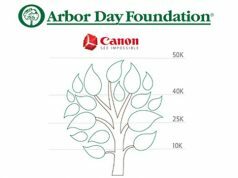 They can share ideas and show creative examples of how they use photography in their daily lives—directly and on social media. In other words, this unique store is not focused primarily on being a profit center. Its goal is to function as a learning center. 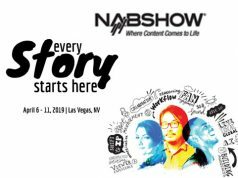 It is a place where guests have the opportunity to influence future product features, help develop new services and share their own personal preferences. The ultimate goal is to provide Fujifilm with a better understanding of where the market is going, and ultimately to enhance their customers’ experience with photography. 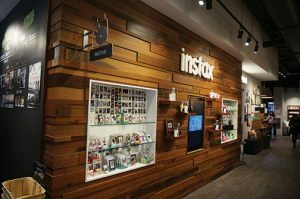 Not surprisingly, the store maintains a robust presence on Facebook, Twitter and Instagram. So what kinds of people come into the Wonder Photo Shop? “It really depends on the time of year,” observed DiCesare. “During the spring and summer, and during the holidays, we get a lot of international tourists who visit the Flatiron District. In the winter and fall it’s mostly locals from the New York City metropolitan area.